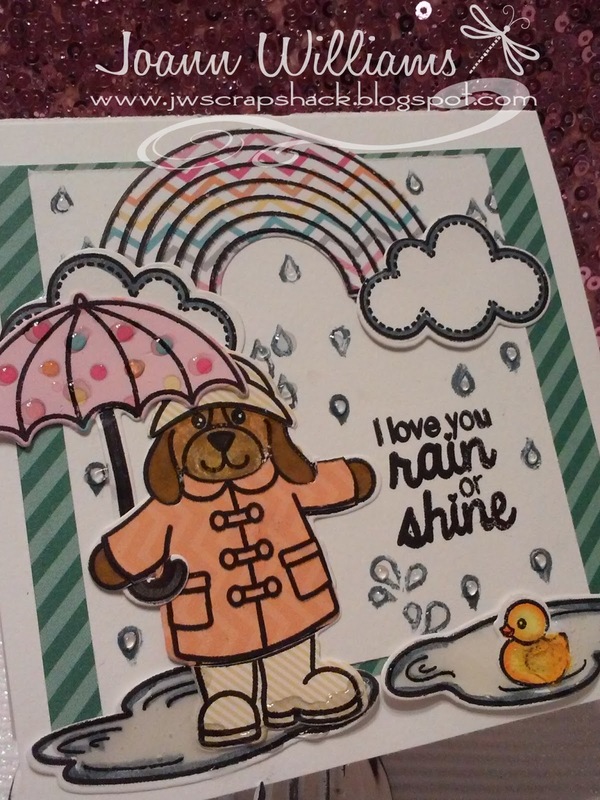 ~Jo's Scrap Shack~: Rain or Shine! I have a cute little card to share with you today. I created this card yesterday and glad that I did. 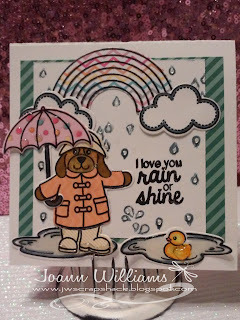 I enjoyed working with this adorable stamp set called, "Rain or Shine" by Sunny Studio Stamps. The owner is a sweet and talented woman and I am proud to call her my friend, the sweet Mendi Yoshikawa. I completely enjoyed working with this stamp set and it's matching dies. When I saw this set, I knew immediately that I wanted to do a cute card with paper piecing. I stamped the umbrella, clouds, rainbow, water puddles, ducky, and the pup onto some white GP cardstock first. I used my Zig clean color real brush markers to color the ducky and the pup's face and paws. I then stamped the pup, umbrella, and rainbow out again onto some patterned paper from the 6x6 Doodlebug Sugar Shoppe paper pad. I just loved the colors in this collection and although it is geared more for birthdays and celebrations, I thought that it would look nice for springtime. 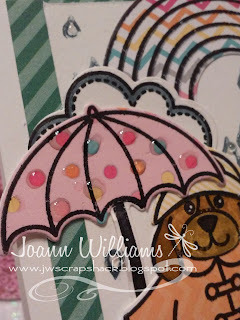 After I stamped out the stamps onto the Sugar Shoppe papers, I cut them out with their coordinating "Rain or shine" dies. I paper pieced the pup's rain coat, rain boots, his hat, the rainbow and the umbrella. My card base is a smaller card size, 4.25 by 4.25" using white GP cardstock. I then took a piece of the "Frankenstein" stripe Let's Polka in the dark paper pad by Lawn Fawn to add as a background layer for some added interest and on top of that, I added another piece of the white cardstock. I took all my pieces and laid them out on the card until I found which way I liked my scene best and then one by one, started to adhere them in place. I left just enough room to place my sentiment which was stamped in Momento Tuxedo black ink. I took a few of the raindrops from the stamp set and randomly stamped them so that it would like like a springtime downpour. I actually stamped the raindrops using my blue gray Zig Clean color real brush marker. 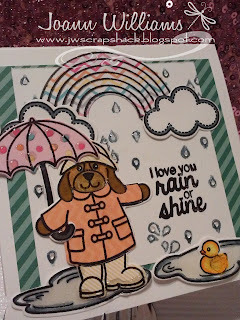 To finish off the card, I pulled out my glossy accents and coated all the raindrops, the puddles, and made sure to add raindrops to the umbrella, some falling onto the ducky splashing around in the puddle and added glossy accents onto the pup's rainboots since he was standing in a puddle. Beautiful attentions to details! This truly is a smile maker! Thanks so much for playing Simon Says Stamp Wednesday “Anything Goes” Challenge! I absolutely love the fact that you are crafting again my friend!! Absolutely beautiful!! Mendi is AWESOME!! I do not love rain but youre card is adorable!! Loveeeeeee this! Thanks for joining us over at the DoubleClick Skittles Challenge! You know I love this card! I really love the paper piecing! Awesome! Love the chevron paper for the rainbow! It has such a great look! The piecing really adds such a great touch to this adorable set.